Nothing on the line so far but I have a couple bites. Update: Last week was a shutout and this week had two players and had to pick. I’m will be looping for Liz Wendt. She just got in. I have her for 2nd stage so it was a good fit. Hated to leave the other player hanging and then I find out they’re rooming together this week! Checked the course on a buggy. The only way to go when it’s hot and windy. 25-30 mph steady all day. Like being in a convection oven. 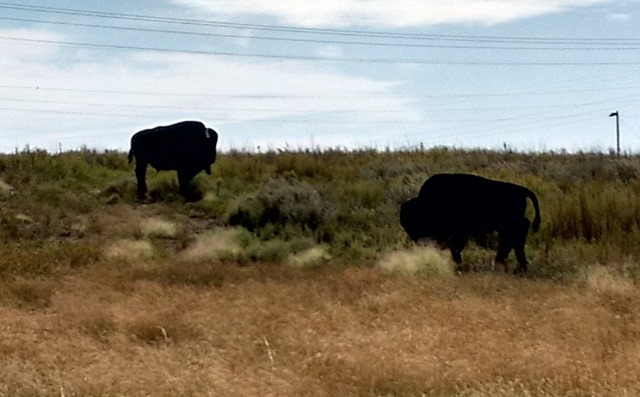 Left of the fifth fairway is where the buffalo roam. Spotted these two along with a calf. NOT! They’re just silhouettes. The real buffalo have long been decimated by the evil white-eyes. A post on Facebook has Mike Carrick fired after the final round in Evian. Finished T-4 with a $151K paycheck. This entry was posted on Tuesday, September 15th, 2015 at 5:34 pm and is filed under Uncategorized. You can follow any responses to this entry through the RSS 2.0 feed. You can leave a response, or trackback from your own site.